Human rights group, Amnesty International, has debunked the claim by the Nigerian military alleging the organisation is working to destabilise the country. 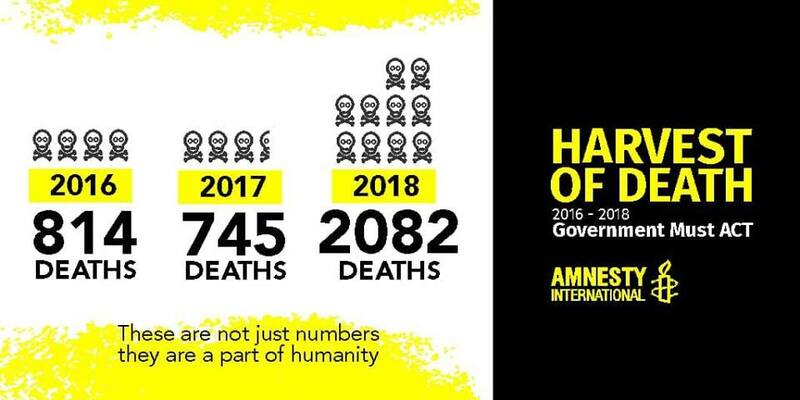 Amnesty International Nigeria Chair, Auwal Rafsanjani, stated the position of the organisation on Monday at the unveiling of its report, “Harvest of Death: Three Years of Bloody Clashes Between Farmers and Herders”, at Reiz Continental Hotel in Abuja. ”My response to the military threat to shut down Amnesty International or any human right organisation operating in Nigeria is that it is not the solution to the negligence or the failure to the untimely response to the issue of human rights and providing security for Nigeria,” Mr Rafsanjani said. ”We are not a threat, we are not joining issues with anybody, we are not agents of destruction and we are not a politically-motivated organisation,” he added. Mr Rafsanjani stressed that his group is not a threat to anyone as it is not a political organisation. ”Amnesty is not engaging in sabotage, but to help in ending the violence in the country. ”We would advise the military to look at the recommendations we have made to the government and address them,” he added. ”Your right can be protected today, that same right can be violated tomorrow and if you do not have a voice to speak on behalf of the voiceless, there would be a problem. Mr Rafsanjani also said the perpetrators of political impunity and corruption at all levels in the country would not want the violence to end. The army spokesperson, Sani Usman, in a statement on Monday alleged Amnesty International had engaged in clandestine sponsorship of dissident groups to protest, as well as make unfounded allegations against the leadership of the Nigerian military. But Mr Rafsanjani said Amnesty International only want individuals at high levels to work together to end the killings in Nigeria. ”Government at all levels has failed to take permanent and proactive measures. Rather than allow it to happen, why not prevent it. Prevention is better than cure. ”As a matter of fact, some of the government officials at the local, state and national government rather than them protecting these victims they indulge in all sort of political games with the lives of Nigerians and they are clearly mismanaging the use of security vote. ”And because of what the state governors are getting, they would not want this violence to end. ”Many of them get these early warning because these attacks do not just happen, there are signs, avoidance to do that has caused a lot of criminal activity,” he concluded.